A health expert recently recommended a break after a 3 hour stint at the computer. He suggested using a timer to get up once every hour. That can be easily done for a bathroom break, to get a cold drink, or for some, to look for a small healthy snack, like a fruit. To ease eye strain one can always adjust the text size to make it larger. To take my eyes away from the screen periodically, I have found the best diversion ever. I stop blogging for a few minutes to watch 3 fancy tail rainbow male guppies, 3 female, 2 recently birthed baby fish, a snail, and a tiny shrimp who may come out of hiding. Besides there are small water plants, including water lilies that seem to grow overnight and often have tiny flowers! 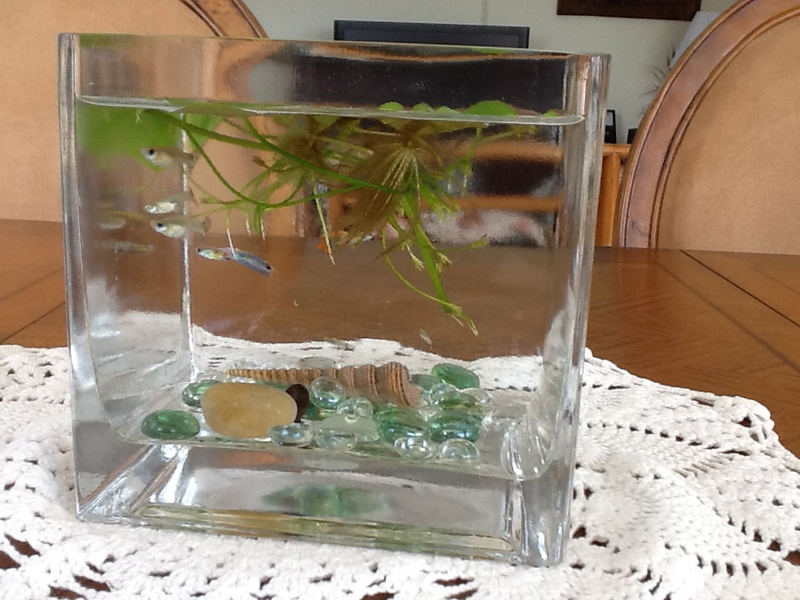 The small aquarium sits on the table where I usually blog on my laptop. Looking away from the computer helps to exercise the eye muscles and ease eye strain. But better yet, get up and move around EVERY HOUR! Take a break from your computer and water those house plants, finish your breakfast dishes or straighten the pillows on your sofa, THEN jump back on your computer! By the way, this is my 5th consecutive post with the WordPress Weekly Writing Challenge; I’m done being challenged. I’ll be ‘taking a break from my Mac screen! This is actually a small 6×6 aquarium that sits on our large dining table where I use my MacBook Pro. Why Do You Have To Do A ‘Daily Challenge’? MY HUSBAND asked, “Why do you have to do a ‘Daily Challenge’? When I was teaching, my students marveled that I had so many stories to tell them. So I’m sure I won’t be at a loss for one post a day, taking a day at a time! Well, WHAT shall I write on? DAY 1 I am thinking of doing the WordPress Weekly Writing Challenge and plan to share Big Island photos in ‘Where Is A Good Place for Meditation?’ I’ll post 5 photos and write about Psalm 5 and prayer and meditation in a SHORT PHOTO STORY. DAY 2 My Short Story of yesterday was a challenge as I wrote ‘A Blog A Day? Why Not?! That was because I saw that ‘RANTING’ was in the list of suggestions. Through my frustrations I found at least 3 ways to post photos; the last was the easiest by far! I discovered a simple way to bypass MEDIA and the Media Library. DAY 3 The idea for this blog, ‘Playing Guitar the Easy Way and Guitar Photos’ came from the number of views I continue to have on ‘My Takamine Guitars’ (June 7, 2012). I thought there must be bloggers who have the same love as me for gospel music, are guitarists, guitar music aficionados/guitar collectors, Christians, or all of the above, thus the follow up blog. And posting the 2 photos was a breeze! DAY 4 That brings me up to TODAY’S BLOG POST! And I already have 3 post topics brewing on the boiler! I may make it after all! Only thing is, I don’t really know how this Daily Challenge works. What day is the last day of this ‘post a day’ Is it on my time or Greenwich time? I don’t even know if I’m in the Daily Challenge since I haven’t the foggiest idea how to ‘grab a badge’! Remember, I just figured out how to post photos! And I have yet to learn how to link better because at this editing, one link still won’t work! Can you find it?! Well, I should get off the computer and fix lunch before I hear something GROWL– (my husband’s stomach)!